The M109 is the prototype for all modern self-propelled artillery, as it is light, compact and capable of both quick movement and relatively sustained fire with relatively good working conditions for its crew, including armor protection. Having been in service for 42 years, it has gone through a number of variants, most of which still retain the same basic characteristics and components. M109 – original variant, with a 20 caliber long howitzer and unique bore evacuator. M109A1 – improved variant, with 39 caliber long gun and automotive improvements. M109A2 – an improved variant with more changes including an all-weather armored head for the gunner's panoramic sight. M109A3 – M109A1 brought up to A2 standards. M109A4 – improved M109A2 and M109A3 guns with improvements to internals, new NBC protection system and other modifications. M109A6 – Paladin, with new turret, barrel lock, etc. As can be seen, there is a lot of commonality among the guns. Barry covers all of the items of interest to modelers, mixing photos with manual illustrations, and as a result provides a very handy "one-stop shopping" document for anyone who wants to do a detailed version of the 109. 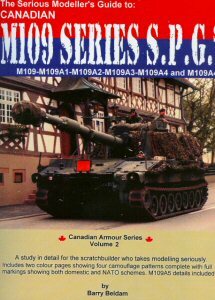 Note that this book, as it states in its title, only covers the standard versions of the M109 as used by the US , Canada and a few other NATO countries, and not the Israeli or German modifications in other than passing. Thanks to Quartermaster's Depot for the review samples.